ICS Danube Logistics SRL’s weekly inter-modal container logistic services between Constanta South Container Terminal and Moldova has emerged as a more cost efficient and reliable alternative to the traditional routing of containers via the Ukrainian ports of Odessa and Illichivsk to Moldova. Danube Logistics’ service includes the transportation of containers with its own sea-going vessel between Constanta South Container Terminal and Giurgiulesti, the transhipment and temporary storage of containers at Giurgiulesti International Free Port as well as the transportation of containers between Giurgiulesti and Chisinau by trucks. Thomas Moser the Chairman of Danube Logistics stated: “with our new service we managed to reduce the transportation costs for containers between Constanta and Chisinau by 33% and as a result the Constanta routing became more competitive than the traditional routing of containers via Ukrainian ports to Moldova. Apart from reduced costs, our clients also benefit from the fact that their containers are delivered directly into the country as this enables us to avoid burdensome and costly inland customs transit formalities in neighbouring countries and frequent delays at border crossings. 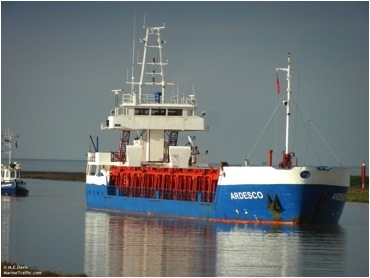 Another advantage is that our vessel can not only transport regular containers but also overweight containers, out-of-gauge containers, dangerous goods in containers and supply refrigerated containers with power during their transportation to Giurgiulesti”. Constanta South Container Terminal, which is operated by DP World, is the most important container transhipment hub in the Black Sea. “Being connected to Constanta South Container Terminal means that Moldovan companies have the choice between 19 different international container shipping lines, offering services around the globe at very competitive sea freight rates” added Thomas Moser. ICS Danube Logistics SRL is the general investor and operator of Giurgiulesti International Free Port and a leading inter-modal logistic service supplier in the Republic of Moldova.